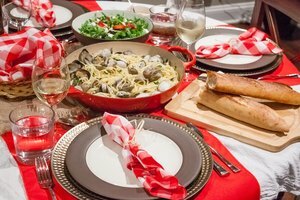 Learn about dinner utensils and how to use them properly. 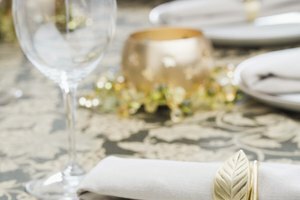 When you attend a formal dinner, you are expected to know and implement the etiquette for using the dinner utensils on the table before you. Once you understand what utensils are set on a dinner table, the purpose of each utensil and how to use the utensils, you’ll be ready to eat accordingly. Forks, spoons and knives are all typical utensils you’ll see set on a dinner table, Generally, there are two or three forks. One is a salad fork, one is a dinner fork and one is a dessert fork. Depending on the establishment, however, the utensils may be brought in with the course for which it is intended for use. Dinner utensils are arranged by order of use. Utensils are set in order starting from the plate and working your way out. 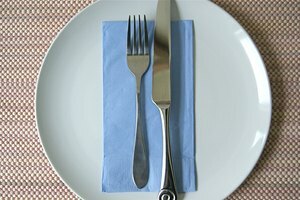 So the salad fork, which is usually the first course, is the first fork by your plate. As each course progresses, you work your way out to the next utensil. It should not be necessary for the diner to distinguish between types of forks; forks are used in order from outside to inside, with the exception of oyster forks, which are placed on the right-hand side in the bowl of a spoon. Probably one of the most difficult things to master with dinner utensil etiquette is how to use a knife and fork when cutting. Etiquette states that you hold the fork in the left hand and the knife in the right hand. You use the fork to hold the food in place, while you use the knife to cut the food into bite-size pieces. After cutting a piece of food, you then place the knife so that the blade of the knife is resting on the right edge of your plate and the handle is on the table. After placing the knife, the fork is switched to your right hand for eating. When you are chewing or your fork is not in use, you have a couple of choices on placing the fork. You can either continue to hold it in your right hand with the tines of the fork pointing in a downward direction or you can place the fork on the edge of your plate, similar to the way your knife is resting in between bites. If you’re eating a food that is soft or flaky, such as fish, the cutting etiquette is slightly different. In these situations, you are not expected to use the knife for cutting. You can use the fork, in your right hand, pressing down with the tines of the fork to slide a bite-size piece of the food. Sawing or chunking up the food is not proper etiquette. In some establishments, a fish knife may be provided, in which case you use the fish knife similar to the manner you would hold a pen or a scalpel. Lorette, Kristie. "Etiquette for Dinner Utensils." 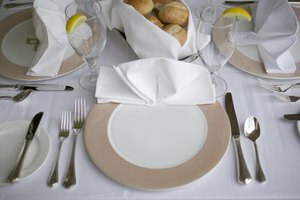 Synonym, https://classroom.synonym.com/etiquette-for-dinner-utensils-12080659.html. 29 September 2017. 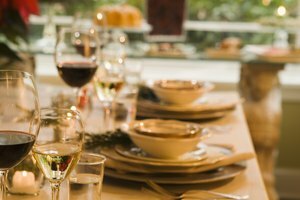 What is the Dinner Etiquette for Utensils?